Corroboree Billabong would have to be one of the most iconic freshwater fishing locations in the Northern Territory. Located at just over an hour from Darwin, Corroboree Billabong is a part of the Mary River system, and easily accessible for a day’s fishing, with a good boat ramp, toilets, and adequate parking. 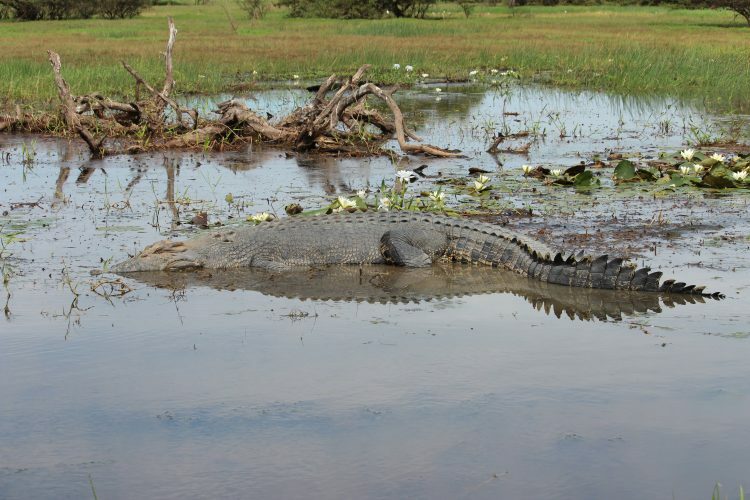 In addition, there is abundant wildlife to be seen, with crocodiles, water buffalo, brolgas, and jabiru always making an entertaining day on the water. Barramundi and Saratoga are two of the most popular fish species found out at Corroboree Billabong, and can be readily targeted by either trolling deep divers along the edges of the lily pads and around snags, or throwing soft plastics deep into the cover provided by the numerous lilies and Pandanus trees that line this waterway. This is by far my favourite method, and very productive even in the middle of the day, when the fish are usually shut down and it is difficult to tempt them to bite. The key to success in Corroboree Billabong is to use small soft plastics on relatively light trace. Three inch Atomic Fat Grubs and Atomic Plazos, on a two metre trace of 30lb leader is about right. The Atomic Plazos are especially deadly as they perfectly imitate a Cherabin, a freshwater prawn common in the Top End. 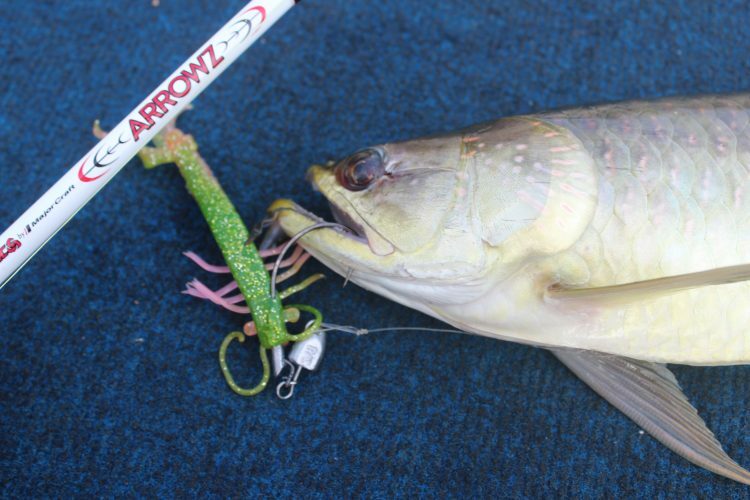 Electric Chicken and New Penny colors are proven fish catchers for me when using this deadly little soft plastic. The trick with this technique is to cast your offering deep into any shadows at the base of Pandanus trees, or parallel to any water lilies. Barramundi prefer a relatively straight, slow retrieve, while Saratoga will often hit the lure on the drop, especially around at the base of Pandanus trees. 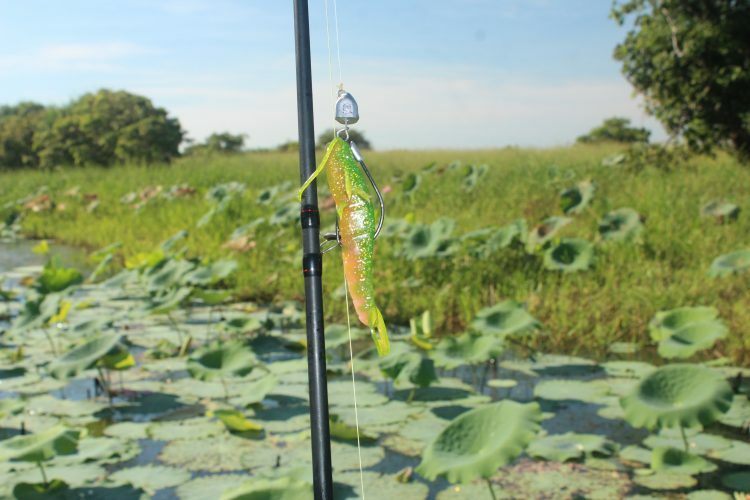 To get the best of both worlds make an appropriate cast and let your lure slowly sink to the bottom, after imparting some twitches and pauses slowly wind your lure back the boat. 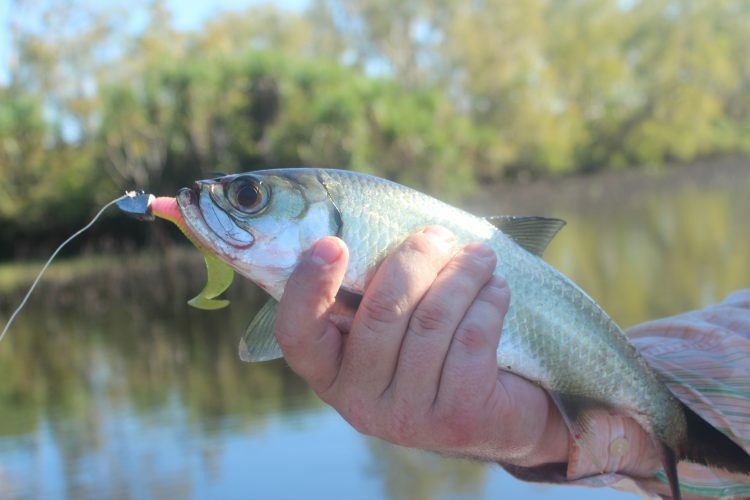 With a bit of luck it will get crunched at some stage of the retrieve, and if you ever get bored of catching Barramundi and Saratoga, a fast retrieve back to the boat will almost guarantee you hook a small but energetic tropical Tarpon. Tarpon are a great sport fish despite their small size, and are always welcome in my boat. I'm a passionate angler with over 30 years experience fishing internationally and throughout Australia. I've had my work published in Fishing Monthly and Fishing World Magazine and I love sharing my knowledge to help more anglers catch more fish. Born and bred on the North Coast of NSW I am now lucky enough to call Darwin in the Northern Territory home where I predominantly chase Barramundi and everything else when the Barra aren't biting!